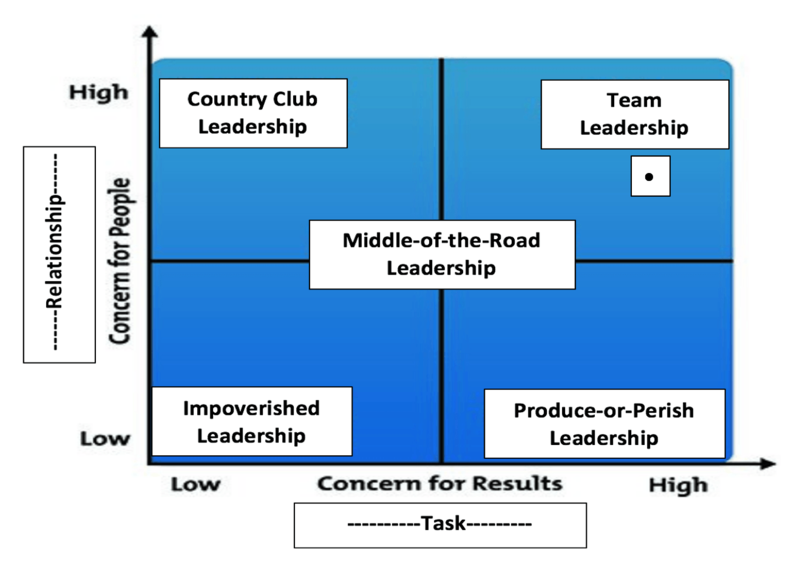 ​The Blake and Mouton Managerial grid is an excellent guideline for understanding leadership and at H-Training we use it with many of our clients. It’s simple design tells us a lot about leadership and the different styles that a manager can employ. However, many clients are often surprised by some of what it indicates. Then it measures a managers style based upon the value they assign to these different elements. The two spectra are measured as ‘concern for the result’ (the task) and ‘concern for people’ ( the relationship) as depicted in the diagram below our advertisement. This is perhaps the most famous style of leadership. This is the no nonsense task master. The ‘you-are-getting-paid-to-do-a-job-so-do-it’ mindset. This is one of Donald Trump’s style of leadership. It is fascinating how a large cohort of industry still practices this style of leadership despite the overwhelming evidence of its sour fruits. Yet, there seems to be a draw towards the humiliation and dominance of this style that perhaps alludes to our more primal instincts. However, a deeper exploration of that topic would need its own blog post. And yet, it is important to remember here that when we talk about this style of leadership it exists on a spectrum, whereby it is not all aggression and machismo. In some instances, strong leaders are required to make firm decisions and resist a more democratic approach when engaging in certain scenarios. Certainly, in our experience of working with the Irish Prison Service there are times when an authoritarian approach is the only option available to them, for example during an emergency. There have also been increasing calls for stronger leaders who take ownership of their sections in recent years. A recent article published by Forbes explores this argument ​somewhat controversially. But in talking about this it is important to emphasize that we are not talking here about dominating people. That is never a good idea, but showing strength is a requirement. Striking the balance is really what needs to happen. This is very common in many walks of industry and can be easily synopsized as a dereliction of duty. There are many branches of multi-nationals in the forgotten corners of industry who have not been graced by the presence of anyone ‘significant’ for more than a few years. The result of this can often lead to a power vacuum, where those left ‘in charge’ without any strategic or operational long-view attempt to take over. The problem with such instances is that people often undermine these efforts and or compete against them as the person assuming the reigns doesn’t really have their authority rubber-stamped. There is little concern here for the task or the relationship and it can just be laziness or indeed a reluctance to assume the reigns that engenders the approach. However, as with the authoritarian style it is not all bad. There can be call for this style of hands-off leadership as we are developing others. 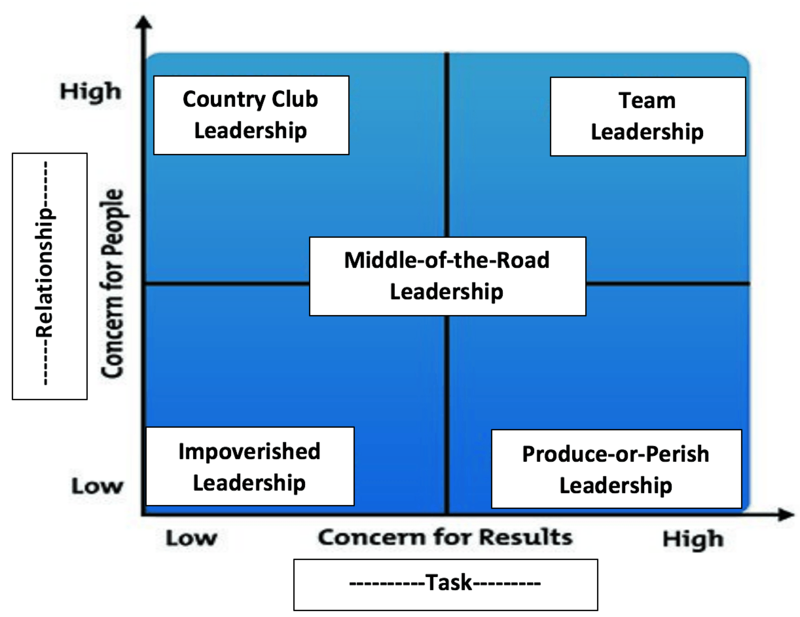 Often managers can be coddled or indeed protected from more responsibility by their own leaders. There comes a time when these people must leave the nest and learn to fly solo. This style of leadership, that enables autonomy can be ideal in such instances. 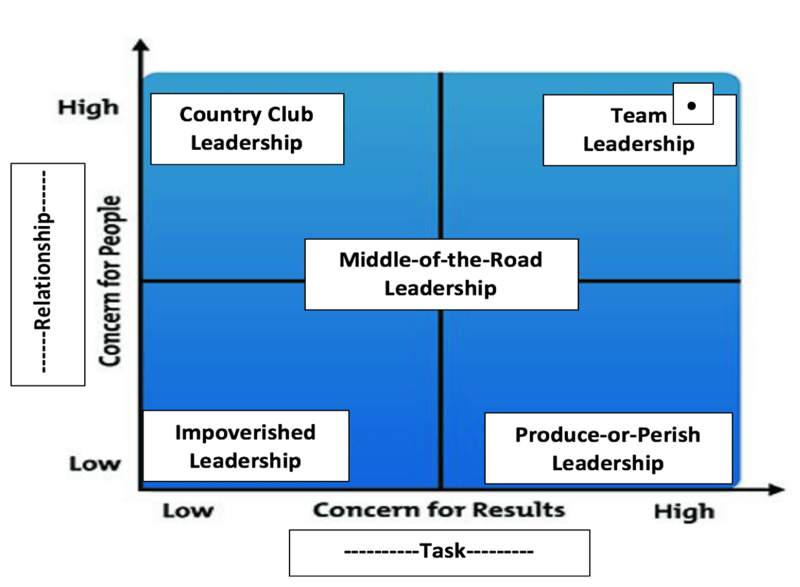 The Country Club style of leadership can be seen as the inverse of the Produce-or-Perish style. Here the focus is all on the relationship and as follows the task is neglected. This is the style of leadership that includes nepotism or as we fondly refer to it in Ireland ‘jobs-for-the-boys.’ Although problems of this nature are obvious, there can also be shades of it that cause problems. Some managers will make their friends the focus of this style and treat others differently, which creates fiefdoms and often results in destructive politics. People are not employed in their roles on the basis of their friendships and this is a dangerous practice. An objective assessment is often required but not always facilitated. Furthermore, it is difficult to be objective when you have a long-standing or positive relationship with someone. This can cloud your judgement and brings us back to the old rule about commercial decisions being made for emotional reason and the inherent pitfalls. And then we come to the ideal. The team leader. This is the manager who assigns a more balanced importance to both the task and the relationship. This is someone who values people and sees them as integral to the success of the organization. There have been a lot of efforts made in the corporate world in recent years to adopt this style of leadership with mixed results. However, it has proven to be a more complex style of leadership than initially meets the eye. Like many ideals there are also some difficult realities to face. In our thirty years of leadership development at H-Training we have seen many managers best intentions thwarted or at least diluted in application. In many walks of management, newer members to the leadership team can bring with them some very lofty ambitions. In this vein they aspire to be different and unlike some of the managers they themselves have had to deal with. They want everyone to be happy and are willing to go the extra mile to accomplish this. Whether it is popular to say it or not, the fact remains that the task is more important than the relationship. Work must be delivered. If an organization fails to do this then there won’t be any relationships to keep. People are complex and it is never a straight forward endeavor to lead them. However, by keeping a balanced approach and knowing your team we can learn to lead them in the best way possible. This is essentially what the last style of the grid, the Middle of the Road Style, says. There is no single perfect style, but a blend of them all will make you a leader that gets results and retains staff. And that, is really the ultimate objective of any good leadership.